Order craft sandwiches (Korean BLTs) or late-night snacks at this well-loved spot. The rotating chalkboard menu features local ingredients. Thirsty? There’s sparkling water on tap or BYOB (like your favorite six-pack)! This rustic storefront boasts over 150 artisan cheeses, charcuterie, mustards, jams, fresh baguettes and a wall of wines—all the fixings for a hearty picnic basket. If you’re having trouble deciding, it’s best to ask for a sample. Welcome to sophisticated, adult Charleston at its best. Attached to the historic Planters Inn, nab an intimate palm-flanked courtyard table and start with the delicate tuna tartare and a glass of bubbly before graduating to the crab and corn soup. For dessert, it’s all about the famed multi-layer coconut cake. For 20 years, this charming, venerable Southern institution has been whipping up shrimp-and-grits, fried green tomatoes and homemade biscuits. Don’t miss the sweet tea, best served in the small, charming courtyard. Another classic Holy City comfort food institution, Cru Café is in a yellow house off Pinckney Street and serves Low Country dishes like smoked pork belly, a toothsome four-cheese macaroni and fried oyster salad in its cozy space. Serving as both an artisanal grocery and gastro-eatery, this spot doles out a proper global mash-up of Mexican, Taiwanese and Korean cuisines, as well as hyperlocal options like clams from nearby McClellanville. Pop in for a canned beer at happy hour, which is best coupled with a bowl of warm, brothy ramen. Housed in a 1920s bank, this buzzy, sophisticated oyster bar and seafood hall has a menu full of crabs, fish and chips, local Carolina oysters and three-tiered shellfish platters. Earn extra culinary points for ordering the classic chowder and lobster roll. We promise you won’t leave hungry. It’s all about local, always-rotating Southern dishes at James Beard Award winner Sean Brock’s immensely popular restaurant. Located in a Victorian-era home, the narrow dining room utilizes heirloom ingredients in recent dishes such as a cornmeal-dusted catfish paired with a warm skillet of bacon cornbread. This upscale tavern helmed by chef Jeremiah Bacon is complete with a wood-fired grill for entrees like crispy duck confit legs and a local snowy grouper. When in doubt, “The Mac”—an 8-ounce burger with aged cheddar, Nueske’s bacon and a side of pecorino truffle frites—is the way to go. Post-meal, retreat to the upstairs speakeasy, The Cocktail Club, for farm-to-shaker libations. Located in a historic church, this stunning new-to-the-scene spot—complete with stained glass windows and high curved ceilings—serves steaks and chops alongside crab cakes, lamb burgers and broiled local oysters. They start serving lunch in early February. 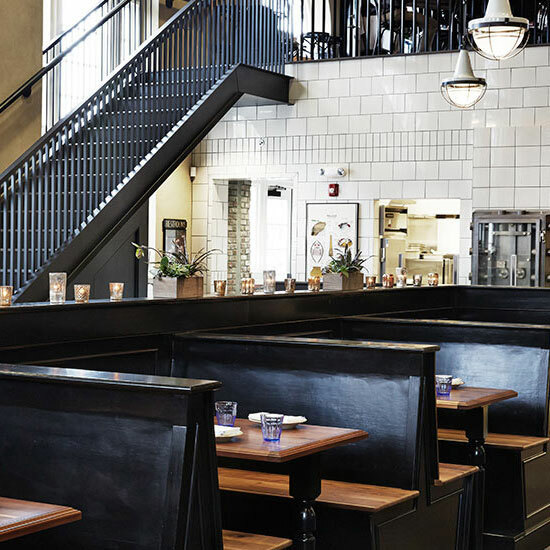 Follow a narrow alleyway into executive chef Sean Brock’s elegant, intimate space accented with exposed brick and fireplaces. The cuisine leans heavily on heirloom ingredients sourced from the restaurant’s rooftop garden, as well as from local fishermen and farmers. The wine pairings that accompany the tasting menu are certainly worth splurging for.